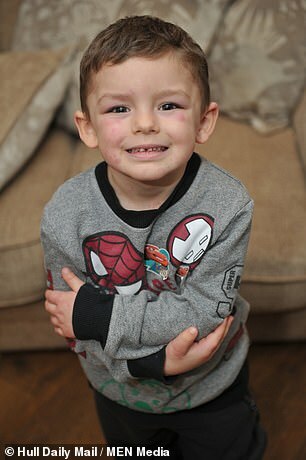 A mum-of-three says she is disgusted by parents who cross the street to get away from her four-year-old son because of his mystery rash. 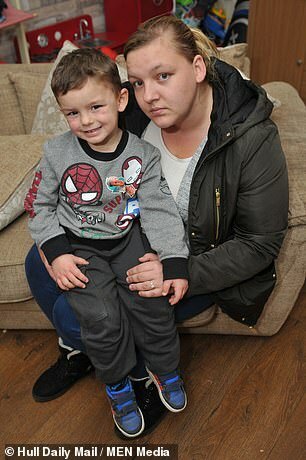 Gemma Lilley, 27, says her son Ashton-Jai Rouse has been shunned in the street by other parents and children who fear her son’s skin condition is contagious. Gemma says his painful rash has baffled doctors and dermatologists at Hull Royal Infirmary. Despite attending more than 350 hospital appointments since the angry red blotches first appeared on her son in March 2015, Gemma claims she is no closer to having a cause or cure. ‘Parents with their kids cross the street when they see us, and they stare at Ashton-Jai and his rash – it’s heartbreaking,’ Gemma said. ‘They think it’s contagious, but I tell them my other two boys are fine. 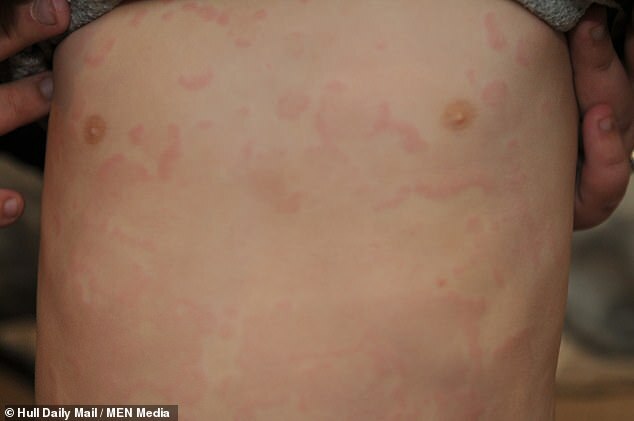 The severe rash, which covers Ashton-Jai head to toe in red blotches and spots, usually inflames once a month and lasts from between two days and two weeks. When the areas get hot and itchy they usually swell up so bad that the poorly boy can barely walk – or even open his eyes. 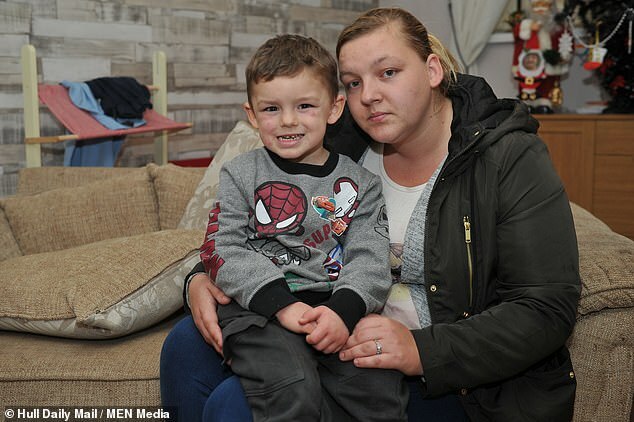 Gemma, of Griffin Road, east Hull, who is also mum to Harrison, six, and one-year-old Paddy, added: ‘Doctors have even said Ashton-Jai will grow out of it – which is just ridiculous. ‘It’s just getting ridiculous now. It is so frustrating and we are just not getting anywhere with these appointments. ‘We’ve had creams and medication, however, the rash just comes back. It comes out in red lumps and bumps, sometimes it looks like his skin is bruising. She is telling her son’s story in the hope other parents will recognise the symptoms and know they are not alone, as well as raising awareness about the unnamed condition. Gemma, a stay-at-home mum and partner to Ashton-Jai’s dad David Rouse, made a complaint to the CQC in February 2017 after feeling she was being ‘palmed off’ by doctors in Hull. But almost two years later – she is still hoping for answers. A Hull and East Yorkshire Hospitals NHS Trust spokesperson said: ‘We are sorry that Ms Lilley is unhappy with the service provided by the Trust and can appreciate how distressing Ashton-Jai’s condition must be for himself and his family. ‘Multiple services at both Castle Hill Hospital and Hull Royal Infirmary have been working extensively with Ashton-Jai and his family to provide the best and most appropriate care possible under the circumstances, and will continue to do so. Taillon outpitches Hamels, Pirates beat Cubs 5-1.